I have now arrived at the second to last Special release from Swedish distillery Mackmyra. The Mackmyra Special 09 Vildhallon was released on November 1, 2012. 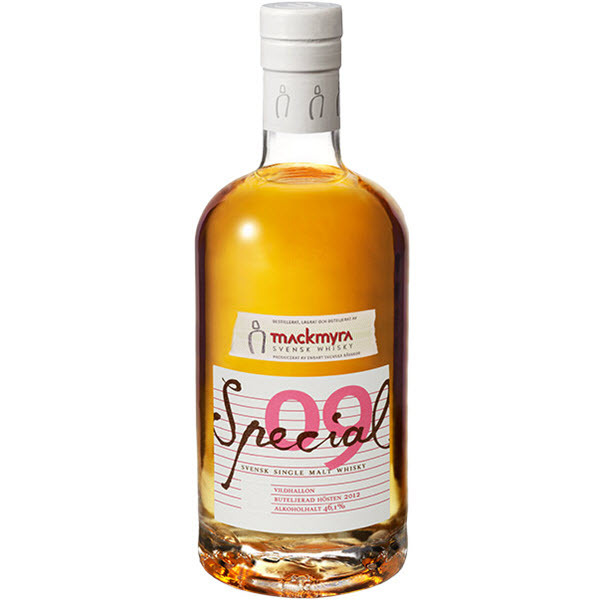 Mackmyra Special 09 is an elegant Swedish malt whisky with intense berry and fruity notes, with finish from casks that have previously stored wine made from wild raspberries. The base is Mackmyra’s elegant recipe which have been put in casks between 2003 and 2006 and stored deep down in the Bodås mine. When it was launched the Mackmyra Special 09 Vildhallon sold at SEK 598. As far as I can see this whisky is now thoroughly sold out. Nose: Quite sweet, with lots of berry notes. Soft and delightful. Delicate even. Reminds me of a lazy summer afternoon. Wandering across meadows filled with flowers, then entering a small copse of trees. Taking in all the smells of the late summer, early Autumn. Warm earth, green leaves mixed with fallen leaves. Taste: Rich and full mouthfeel. A bit more spicy than anticipated from the nose. Still lots of fruitiness and runny honey. A bit floral and herbal. Lots of 'green' here. Finish: Medium long finish. Still sweet, mainly the honey now, and still quite 'green' - with dried herbs. Comments: An even Steven sort of whisky.